Visible light that we see is a miniscule part of, and in the middle of the full ElectroMagnetic (EM) spectrum. The full EM spectrum spans from nuclear gamma rays to radio waves (wavelengths of a trillionth of a meter to hundreds of meters). In the middle and an extremely small part of this full EM spectrum is a band of visible light that spans the rainbow colors from the violet wavelengths to the red wavelengths. The red end (InfraRed (IR)), is at the longer wavelength extreme of visible light band. IR starts from within the visible light band, and extends beyond into invisible wavelengths. Near IR (NIR) refers to the visible end of the IR band or the end nearest to visible light. In most definitions, NIR wavelength spans from about 750 to 1400 nm(nanometer = 1 billionth of a meter). The wavelength being used for PDT for NF is 633 nm which is around the low end of the definition of NIR. The color is cherry red. Furthermore the light is safe, triggers the light sensitive chemical, and gives good penetration into the tissue. In addition to the PDT application, NIR light by itself is used for healing. The NIR light interacts with the mitochondria of the cells and almost magically promotes therapeutic healing of injured or unhealthy cells. Healing applications of NIR light are discussed under NIR LIGHT DIRECT APPLICATIONS. NIR light sources for medical applications are usually lasers or Light Emitting Diodes (LED). The early brain cancer PDT studies by Dr. Whelan and research team used a laser source. 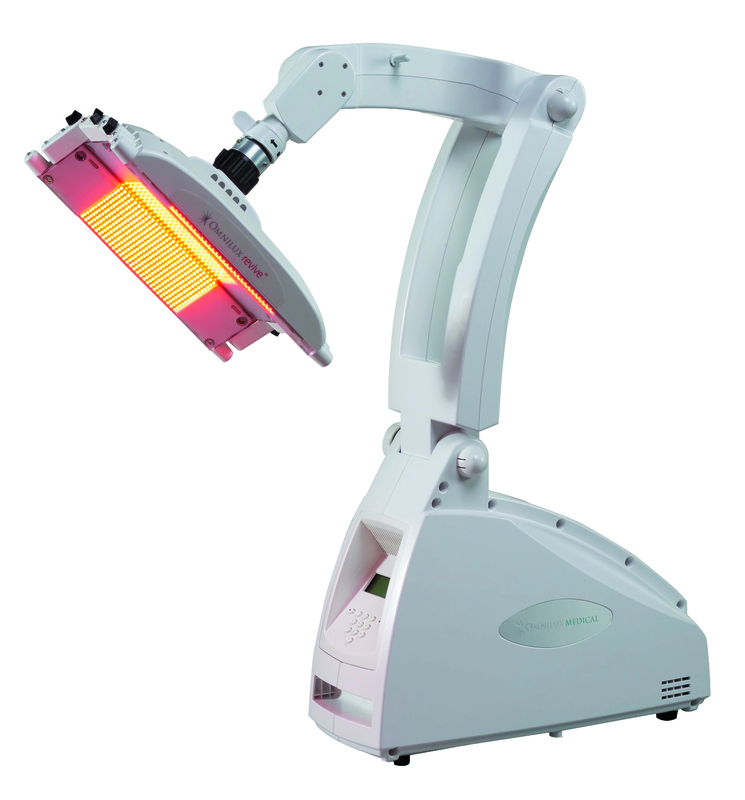 The current NF clinical studies use 633 nm LED light sources. The specific LED light array currently being used for the (sub)cutaneous NF studies is the Omnilux Revive show to the right. The output is 105 mW/cm2 at nominally 633 nm. There are 5 light panel segments on the approximate 13×14 inch LED array head. Each panel segments is hinged to enable the panel to conform to the contour of the treatment area. Interesting publishing and can you please reply if you are affiliated with the Dreamspa system from the Light health research LLC group? Have you seen and used the Dream spa system and how effective is it? Greatly appreciate any feed back on the unit as we are inquiring about the system.